This article submitted by Linda Stelling on 5/24/00. Paynesville cable customers can expect better reception and additional channels, but also will have to pay more for their cable service. Mediacom is rebuilding, upgrading, and constructing a technologically advanced broadband fiber cable system in the Paynesville area, according to Tom Bordwell, Mediacom's government rela-tions director. The upgrade will also provide better service reliability, digital television service, and high speed Internet service. 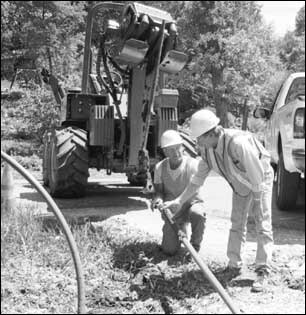 New conduit work for fiber optics was laid last week in the Paynesville area. The first phase in a construction upgrade for the Paynesville cable system is now under way. Mediacom purchased Triax Cable-vision last year. The city council was exploring a change in cable companies and held a series of meetings to review Triax's service. Disgruntled customers vented their frustrations over poor service to the council at two hearings in February 1999. Customers complained about snowy pictures, frequent signal disruptions, and poor response to service calls. The city's contract with Mediacom expires on June 1, 2001. Bordwell noted Paynesville's dissatisfaction with Triax and outlined some of the changes to the council in February. Mediacom will be upgrading the power of the Paynesville system from 400 megahertz to 750. This will allow support for additional channel capacity and future upgrades. The system will also be switching from analog to a digital product, giving the viewers a better quality picture. On May 8, Paynesville Township approved Mediacom's request to bury the cables in a few township road ditches. Most of the cables will be strung on power poles in the same location as the present lines. The township gave permission to dig and bury cable. They were also required to restore the road right-of-way. Lee Steckman, Mediacom's project manager, said the current upgrade will take about eight weeks. The work is being done in three stages. The workers are presently in the first stage which deals with installing conduits overhead next to the existing cables, and in some instances, underground where there are no electrical poles. The construction crew laid about 7,000 feet of conduit underground last week. There are about 31 miles of cable being upgraded in Paynesville Township and within the city of Paynesville. The second stage is placing the fiber optic cable inside the conduit. The third stage is upgrading existing electrical connections and amplifiers on poles which lead to individual homes. According to Bordwell, customers will receive up to six new channels on either basic or extended service. "Each system (basic or extended) will be looked at differently," he added. Along with the channels will be a rate increase. Mediacom does not know yet which new channels will be added. Service disruptions during construction will be kept to a minimum and every effort will be made to quickly restore any areas disturbed by the construction. Customers may contact Mediacom's 24-hour customer service department at 1-800-422-1473 with concerns or com-ments. According to Bordwell, Mediacom will be notifying customers by post card when work is disrupting their area. Bordwell said the Internet access will not be available until the end of the year.